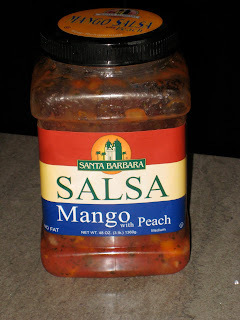 Mango Salsa Chicken- SUPER Good! Have you seen this baby at Costco? I remember I bought it once last year and I was stressed out because I though it might go bad before I could use it all....lol. Funny what stresses me out. Basically you just dump it over chicken...lol...that's it. Bake 30 - 45 min at 350. You can also put the chicken in a freezer bag and just add in the salsa for a quick freezer meal. That looks delicious! And easy, which I totally love! Thanks for sharing! Your welcome! I'm trying to improve my food photography. It's a struggle. Plus I don't think raw chicken is very photogenic. :) If you try it, let me know what you think! It's also good if you add a can of drained corn and black beans. Mmm! Good idea! I'll have to try that!! I was looking for something to make for dinner tonight and I found this. It looks delicious...gotta try! Thanks!